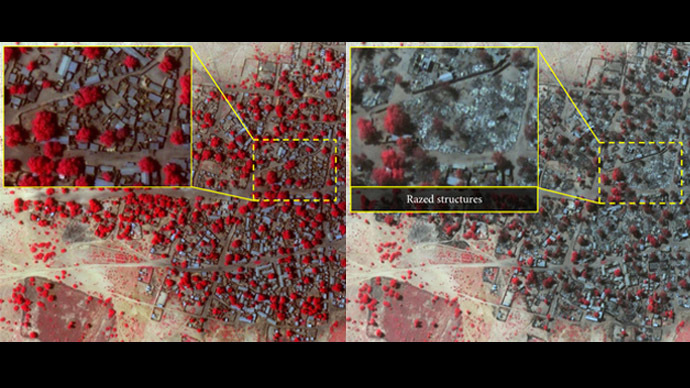 The scale of last week’s attack on the Nigerian towns of Baga and Doron Baga by Boko Haram militants has been shown graphically in before-and-after satellite images revealed by Amnesty International on Thursday. 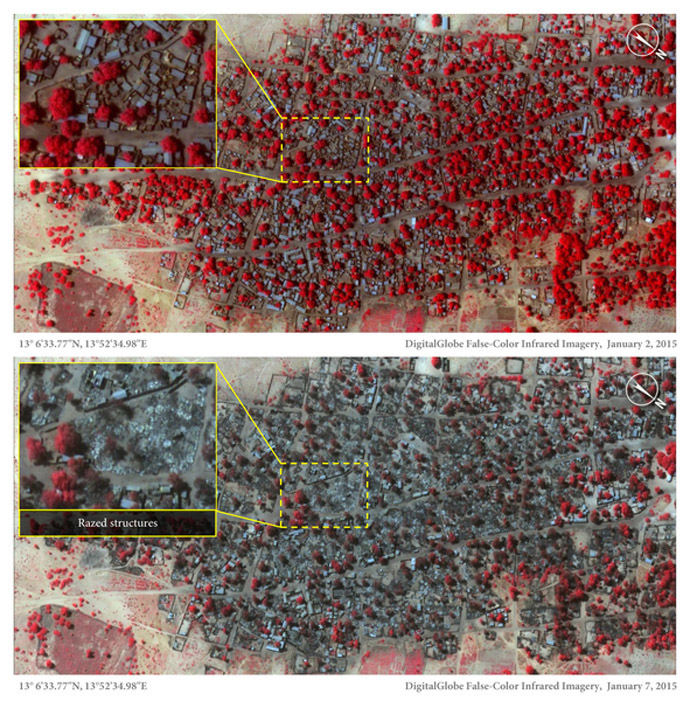 Satellite images, taken on January 2 and January 7, respectively, show the change to two densely populated towns, 2.5 kilometers from each other, where more than 3,700 buildings were damaged or completely destroyed by fire, Amnesty International reported. Baga and Doron Baga, some 160 kilometers from Maiduguri, the largest city in northeast Nigeria, as well as at least 16 neighboring villages and other towns, were devastated by a series of attacks of Boko Haram militants that began January 3, local officials said. “These detailed images show devastation of catastrophic proportions in two towns, one of which was almost wiped off the map in the space of four days,” said Daniel Eyre, Nigeria researcher for Amnesty International. "This week, Nigeria’s Director of Defense Information stated that the number of people killed in Baga including Boko Haram fighters “has so far not exceeded about 150”. These images, together with eyewitness accounts from those who survived the attack, suggest that the final death toll could be much higher than this figure,” Amnesty International’s Eyre said. Thousands of people have fled the violence across the border to Chad and to other parts of Nigeria, according to the human rights watchdog. Analysis of satellite images suggests that this time desperate residents used wooden fishing boats to flee across Lake Chad. “They killed so many people. I saw maybe around 100 killed at that time in Baga. I ran to the bush. As we were running, they were shooting and killing,” a male Baga resident told Amnesty. A woman added: "I don't know how many but there were bodies everywhere we looked." The area around the towns is still in rebel control, so for now it is impossible to estimate how many people have been killed. Boko Haram militants are currently in control of an area of about 52,000 square kilometers – approximately the size of Costa Rica or Slovakia.